During the academic year 2017-2018 Dover College elected MNDA East Kent as their Charity of the year. The charity was specifically chosen in memory of Ronnie Philpott, a much-loved member of staff at Dover College and former mayor of Dover. During the year the school held many events, including a 15 mile whole school sponsored walk, ‘Whiskers for Ronnie’, ‘100 Mile Month’, themed non-uniform days, garden parties, cake sales and a host of other activities and events. Staff, students and the parents together raised the amazing sum of £10,431.35 for MNDA in East Kent. MNDA East Kent would like to thank everyone who worked to raise this money and everyone who contributed. 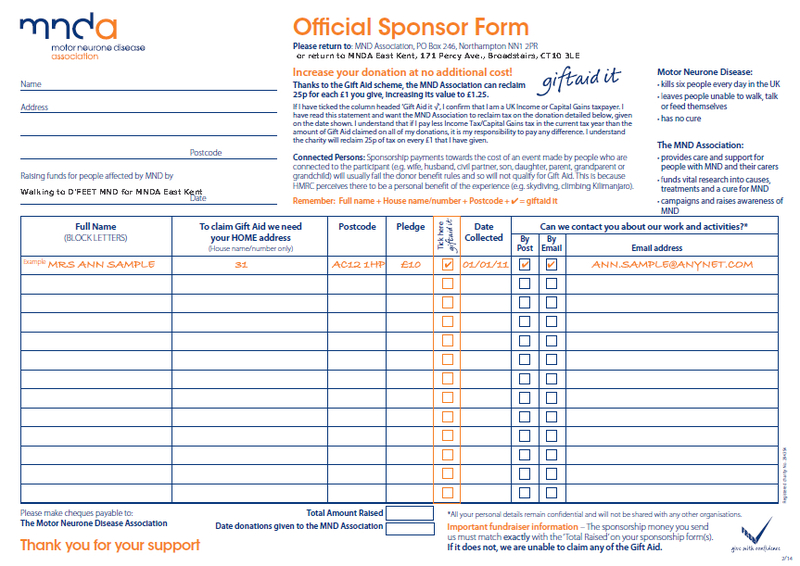 This sum will be used to support people living with MND in East Kent, their carers and families. The Headmaster Gareth Doodes, Laura Walters teacher of Art and Charity fundraising co-ordinator, and several students presented Clive Hudson chair of MNDA East Kent with a cheque on Monday 1st October 2018. Silence Speaks is the Association’s activity to raise awareness of speech loss in over 80 % of people living with MND. During October people take up the challenge of raising awareness of the issue by running a variety of events, these include sponsored silences, silent discos, silent quizzes and lots more. staff at all three trust hospitals to raise awareness of the support people living with MND will need with their carers should they attend or stay in hospital. As part of this programme, Chrissie together with Judy Keay, Association Visitor Coordinator and Katy and Mark Styles went to the Queen Elizabeth the Queen Mother Hospital in Margate on Friday 20th October to explain about motor neurone disease but with the added pressure of doing this silently. These awareness activities are held weekly within all three hospitals and staff from all departments are encouraged to pop in and see the presentations on those days. Together Chrissie, Judy, Mark and Katy had downloaded type to speech apps on iPhones and iPads, creating key phrases to explain what we were doing and what help people in hospital with MND many need. We used pads and pens, laminated letter sheets and pre-printed leaflets from the Association. We met staff from all different departments with very different duties who were all very interested to learn about speech loss in MND. Staff said that as we were not speaking it made them not want to speak. Others commented that it was really important to highlight this issue and asked what they could do to support someone with MND. for her dedication to supporting the people living with MND in East Kent. Extra Mile awards are awarded to staff who have gone above and beyond to support people living with MND, their families and carers. Katy had pre-recorded a short speech to explain to Chrissie why she was receiving the Award. The Chief Nurse, from the East Kent Hospital University and Foundation Trust, Sally Smith attended the presentation and congratulated Chrissie. On Monday 9th October I attended morning assembly at Dover College to talk about motor neurone disease and the MNDA. The college had lost a much loved member of staff to MND and the students have decided to support MNDA through the school year and many events are planned. The presentation was about MND/Kennedy’s Disease, and how the MNDA supports people and families affected by these diseases. The presentation focussed on the celebrities the student might know of, who support MNDA such as Professor Stephen Hawking, Benedict Cumberbatch, Charlotte Hawkins, Eddie Redmayne and Stuart Broad. Also featured were inspirational people living with MND/Kennedy’s Disease, who do everything they can to raise awareness of MND and to raise funds for MNDA. People like Mark Styles who was instrumental in getting Kent County Council to be the first council to sign the MNDA Charter, Jason Liversedge who despite being in a wheel chair managed to ascend Snowdon and also to abseil off the Humber Bridge and EyeGazeArtist, Sarah Ezekial who creates wonderful works of art using only her eyes. Thanks to students and staff at Dover College for supporting MNDA and we look forward to hearing about your future activities.